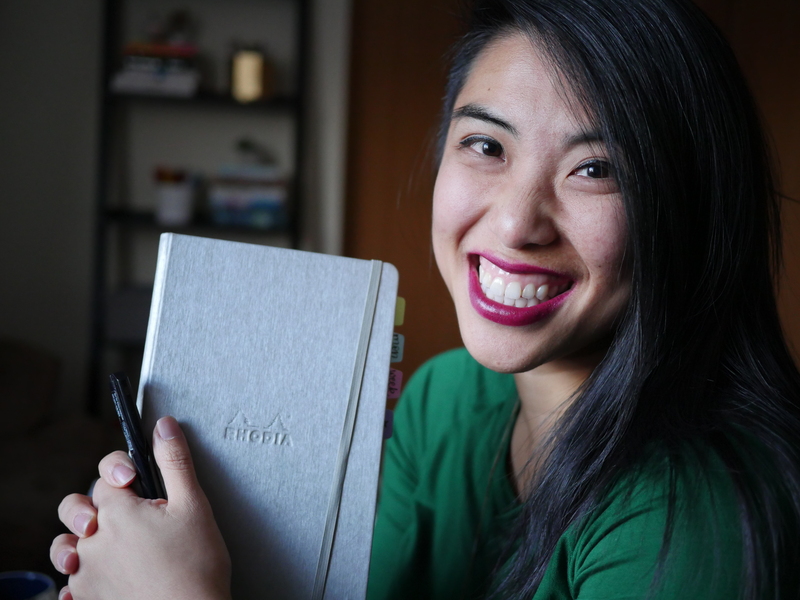 It’s been a while since I’ve talked about my bullet journal set up in my Traveler’s Notebook! You might know by now that I believe in evolution of styles and systems over time, and this month is just a bit different. Here’s what I’ve got going on and why I’ve made these changes. Note: This post contains affiliate links, which just means if you happen to buy something, I make a small commission that goes back into supporting the blog – thanks in advance! I am using a throwback Foxy Fix Notebook cover (which I recently spilled water on, *sob*) – this is a Classic No 7 compact, with 4 elastics to hold 4 5″x7″ inserts. Inside I have 3 inserts, a Foxy Fix dot grid (the paper is awesome, it is white, subtle dots, and I have very little ghosting), and 2 other dot grids from May Designs. The first insert is my Everything Bullet Journal insert – all my tasks go into this insert, work and personal. I have work bullet journals that keep track of my project notes and planning, but for tasks, everything goes into one place so I don’t lose it. When I’m on the go I will use my Google Keep app on my phone, but will migrate the task over to my insert when possible. In the traveler’s notebook system, I only have to replace ONE insert instead of migrating every collection when I run out of space. Seeing these things gives me a more realistic picture of my time. I think next, I want to add a budget forecasting component for big social events and other gatherings I plan for to be more proactive in my finances. Monthly overview. Inspired by the Inkwell Press planner, it combines my love for hexies with intention and loose categorization. I am apparently continuing on with the Pride theme for July as well! The hexagons represent a category, a project, or a focus. Thinking about any major project I have this month, I then think about the critical action steps I need to take to move that forward toward the due date. This will keep my work clear in my mind as I make my week to week spreads. Even if I don’t reference this page, the process of sorting through the different projects is the point! You’ll notice I also have a few blank ones – this is not because I planned poorly, but rather I embrace what we do in our teaching, which is to bring intention and then leave room for whatever emerges in the moment. I need to leave white space for things to evolve and change and emerge, since life is pretty unpredictable. Weekly Spread. This is a change up inspired by @bluelahe on Instagram. I am using the weekly on the left to highlight my main anchors of commitments and events. Notice I don’t actually do times and appointments – those are in my Google Calendar (thank goodness). In the right-hand side of the box I’ll be filling in gratitude, moments to highlight, and the weather. On the right page I am using the running task log. I can quick brain dump my tasks, creating a box on the day I want to do that task. If I need to migrate, I’ll just write in the arrow and draw in a new box under the appropriate date. In this case I am also using “W” as weekend. Another grand experiment! I’m using stickers from the fabulous Helen at @thecoffeemonsterzco – who has adorable stickers for so many functional things. I am also using the new Tombow monoline drawing pens in my planner – I talk about how they work in the video above, so check it out if you want to hear more about them! So that’s what I’m working with this July – every month I think about what’s working, what I need, and what will help me accomplish that. It’s nice for it to look pretty (because it keeps me coming back to it), but most of all I need it to be functional – and only I can determine what will help me function in effective ways. So, we’ll see how this works and if it doesn’t, we change it up for August. What are you trying this month? Let me know in the comments! You’ve reminded me that I still have to do my July set up. Man, am I behind!